Now this is an interesting development. After Intel hinted that it is open to accept in its foundries production of chips for other companies, even ones based on ARM's designs, a Citi analyst claims that Apple is probing possibilities to move from Samsung's foundries to Intel for its A4 and A5 chipsets that are powering the current generations of the iPhone and iPad. And the story gets juicier - both companies are to start off with manufacturing, but Intel wants to make chip designs for Apple in the future, and be its sole provider. ARM-based silicon is all the rage now, but Intel is planning to have its 22nm production process ready before anyone else, and should have benchmark-beating mobile chipsets by 2013. All of this doesn't sound like Apple moving to Intel because it has something better to show than ARM in this very moment, but it sure sounds like Cupertino is trying to diversify from Samsung, which is producing the bulk of silicon that goes into the iPhone and iPad. Or maybe Apple just doesn't feel comfortable having all its eggs in one basket. Still, that lawsuit it filed against the South Korean company might be having some repercussions already, after all. If that's the case, the probability of seeing AMOLED displays on Apple's gadgets is slowly approaching zero. I don't think that's the reason why Apple prefers IPS-LCD over super amoled (for now). The iphone won't be able to attain their retina display with super amoleds. For the record, "Retina Display" is just a marketing name that Apple used to described it's increased resolution. However this was achieved by simply doubling their HVGA resolution and keeping the same 3.5 inch size display. If they had gone 1/2 an inch bigger on their display, they wouldn't be able to claim their "Retina Display" as unique or new for that matter. While I hold nothing against Intel - they make some smashing desktop / laptop SOC's, but IMO this could potentially turn into a disaster for Apple if they choose to move to Intel this year. For example: 1. Intel will need to purchase an ARM licence (because they don't currently have one) 2. Alternatively, Intel could also buy out ARM as some analyists are predicting. 3. If Intel chooses to use their own ULV SOC's then expect a massive performance hit like their recent tablet showing - until they adapt & optimise their x86 architecture to suit phones and tabs. 4. All of this takes time, and its clear Intel aren't really in a position to be competitive in 2011/2012. So... Hopefully they stick with Samsung for the time being, until Intel is actually ready to go. Actually, Intel does have a license to make ARM chips. Although Paul Otellini (CEO of Intel) has stated that he wouldn't make ARM chips, his statement was "the short answer is no". The long answer is probably that he would to Apple, with the idea (and probably the promise) that Apple would switch to the x86 architecture in the long run. The current foundry, Samsung, is a competitor of Apple's, and Apple has accused them of patent infringements, so Samsung is out. 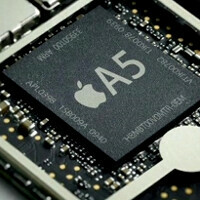 TSMC is a possible choice, but only Intel will be ready to go with 14nm technology in 2013. They've already developed the technology, and they've started work on their plant in Arizona. The plant will cost $5 billion, which is a formidable barrier to entry. In addition, Intel already makes chips for the MacBook, and they make the Thunderbolt ports for Apple computers. The tri-gate chip technology that Intel has is probably 3 years ahead of everyone else, and of course Intel will be years ahead on 14nm, too. I'd say that Intel is their best choice. Intel will deal because they want to convert Apple to x86, validate that it kicks a*s, and then eat ARM's lunch. Don't confuse Intel with Microsoft and Cisco. They're out there on the technology curve, mainly because they're the only ones who sell enough to pay for the R&D. If this is because of the lawsuits...oh well.... But, Apple will survive. Intel is the way too go! Facts proven Intel is the best cpu around cough cough at least in computers it is.